In the US state of Michigan, the surveillance camera took off the angel. 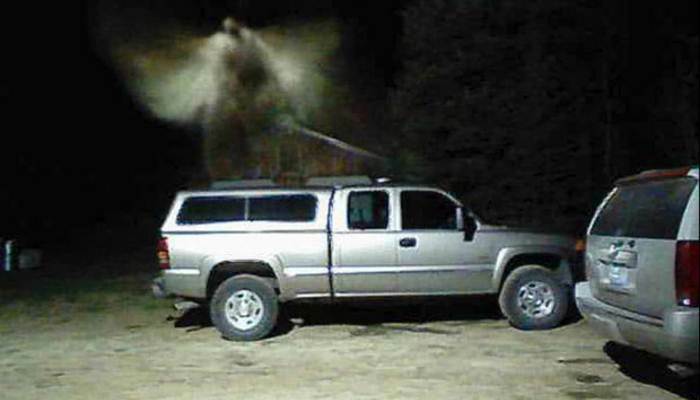 54-year-old firefighter Glen Thorman claims that the device, reacting to traffic, photographed the celestial guardian of his house in the town of East Jordan. The camera installed on the window made two photographs at night with a difference of one to two seconds. On one of them, an angel-like winged figure hanging in the air is clearly visible, on the other it rises and is partially hidden from view. The angel held a sword in his hand. Thorman says that when he looked through the pictures in the morning, he was shocked. “I thought,” Wow! It’s an angel! “. Honestly, my eyes flowed with tears. I immediately sent a photo to my wife and pastor. And the pastor immediately confirmed: “This is an angel,” – Torman. Glen says that his family is very religious and constantly prays to God about the guardian angels. “I already firmly believe in the Lord, and this has only strengthened my faith … It’s real, God is real, the angels are real and miracles happen,” says the firefighter. Skeptics, however, believe that it can be a night moth, too close to the lens. But Glenn says that it’s too cold for moths – after a prolonged winter, snow has not melted everywhere yet. And, if it really was an insect, the camera would react earlier and make a few more photos. “My camera took a lot of pictures, but I’ve never seen anything like it,” insists the American. Deniel Maes, the pastor of the church that the Torman family visits, also has no doubts that the picture shows an angel. “We believe that God sends angels to protect us when we pray,” says the priest.